Tomorrow’s GDP day is one to note. At 8:30am, the Bureau of Economic Analysis will release its Q2 advance estimate that, for the first time in history, will put U.S. GDP at more than $20 trillion. In other words, personal consumption, investment, trade, and government consumption will together value $20 trillion in economic activity. The world has never seen a $20 trillion economy before, and it’s worth exploring what it looks like and how we got here to put it in perspective. The time it takes for our economy to expand by $5 trillion is getting shorter and shorter. Compounded growth should make this a no-brainer, but visualizing the time makes this stark. Even with the timing of the 2008 recession, it still takes less and less time to reach our next $5 trillion than our last $5 trillion. Today, we’re entering our 109th month in economic expansion, higher than the average of previous expansions in the modern era. 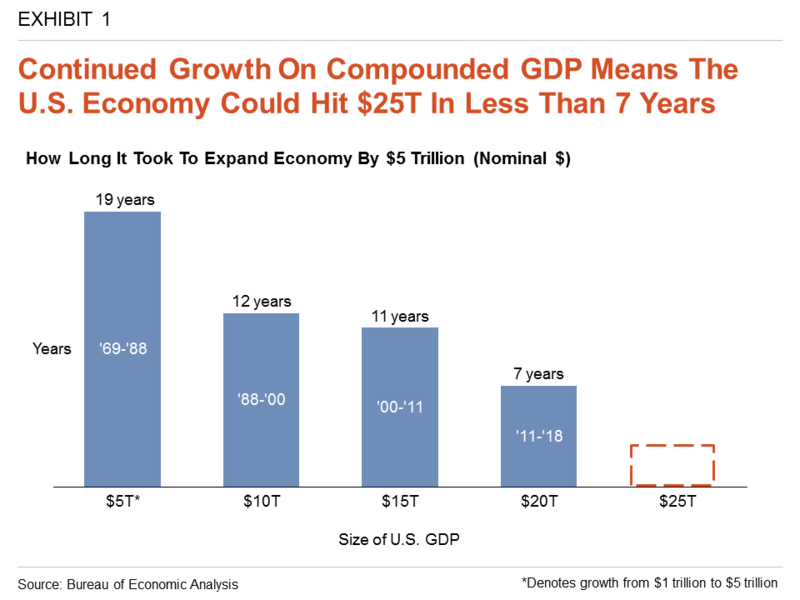 If the economy continues to grow, we’ll hit $25 trillion in less than seven years (EXHIBIT 1). We’re shifting to a service-driven economy. 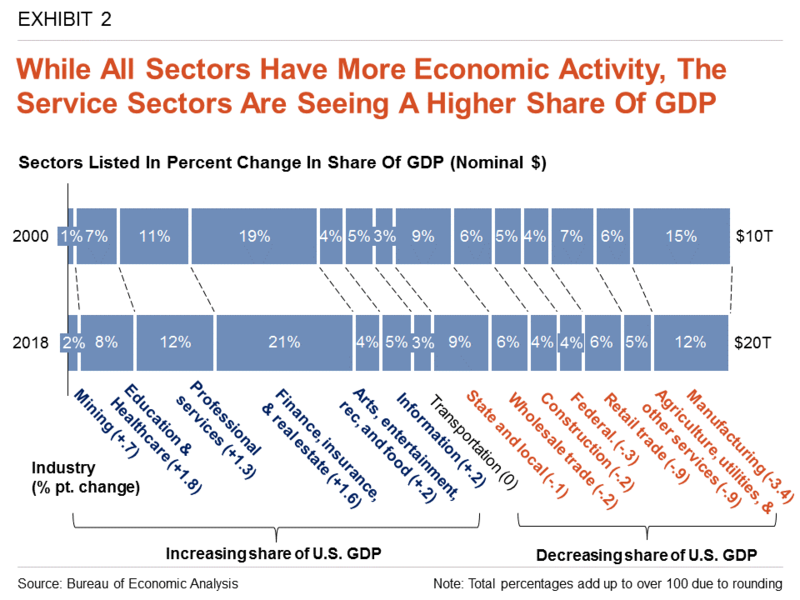 While all sectors have grown in total economic activity, some have seen significant changes in their share of GDP. Below are a few examples (EXHIBIT 2). “Mining” jumped from 1.1% to 1.8% of U.S. GDP – a 64% increase. On the other end of the spectrum, manufacturing, as a percentage share in the total economy, dropped from 15.1% to 11.7% – a 23% decrease. 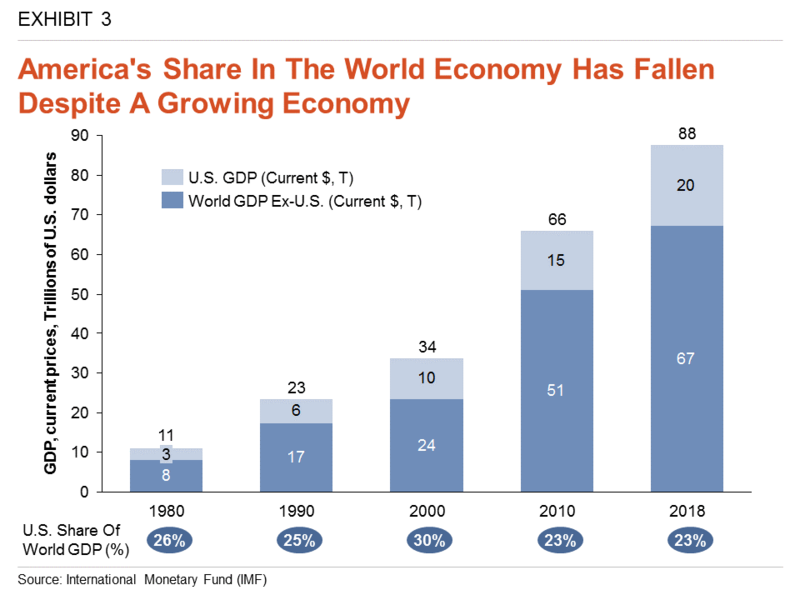 Our economy is growing, but the world’s economy is growing faster. While the U.S. economy is growing fast for an advanced economy, its share in the world economy is at its lowest point in modern history. Global growth accelerated notably between 2000 and 2010, the period when China was integrated into the global economy (EXHIBIT 3). As former developing economies become more advanced, it will be interesting to see if they can keep up the pace. Watch tomorrow for the HPS GDP breakdown in the morning. Over the course of the day, we’ll be putting $20 trillion in context with ’20 for 20′ examples on Twitter.